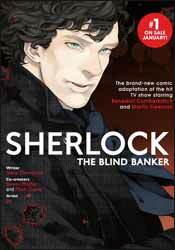 The second incredible manga adaptation of the hit television series starring Benedict Cumberbatch and Martin Freeman, printed in English for the first time! A mysterious break-in at a bank… Some enigmatic symbols… Hidden dangers… Could the case of ‘The Blind Banker’ be too dangerous for Holmes and Watson to handle? As Sherlock investigates a murder and starts to find clues, might the killer strike again…? Back in 2010, I found writer Stephen Thompson’s contribution to Sherlock to be the least memorable instalment of the first series, sandwiched as it was between Steven Moffat’s scene-setting introductory episode A Study in Pink and Mark Gatiss’s attention-grabbing season finale The Great Game. The unexpected upside of this is that I had forgotten most of the story, and so reading this manga is almost like encountering a brand-new adventure for Sherlock and John! The Blind Banker may have been a relatively weak entry in the series, but that’s only in comparison to the tremendous strengths of the other two episodes. Held up against contemporary British drama as a whole, it’s still a strong story, with many entertaining moments – such as John losing his rag with a chip and pin machine while out shopping, and Sherlock battling a sword-wielding enemy within 221-B Baker Street, yet appearing not to have moved at all while John was out. The detective’s particular type of lethargy further annoys his friend later on, when he uses John’s computer rather than his own because it happens to be nearer – Sherlock says it took him less than a minute to guess the password.